At the orthodontic office of Lisa P. Howard DDS MS, we help patients of all ages achieve the smile of their dreams. We offer state of the art orthodontic treatment to meet individual needs and lifestyles with braces, ceramic braces, Invisalign Teen and Invisalign to enhance the quality of your life. 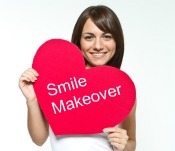 Valentine’s Day is just around the corner… so please call our office today to schedule a free smile exam for yourself or someone you love today!